Kameron Hurley On Writers Getting "Branded"
Read Kameron Hurley's essay "Branded: The Good. The Bad. The Ugly." "I think that as much as we like to pretend that what gets us ahead is our originality and creativity, writers – whether consciously or not – end up either being branded or branding themselves over the course of their careers." Tearing your hair out at rejection slips that make little or no sense? 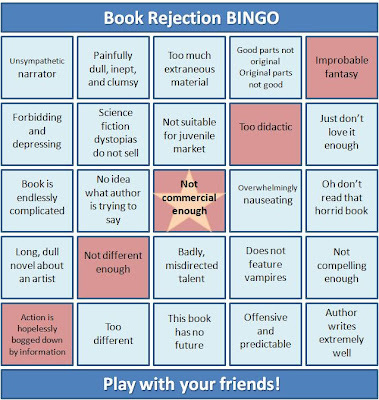 Instead, play... BOOK REJECTION BINGO!! 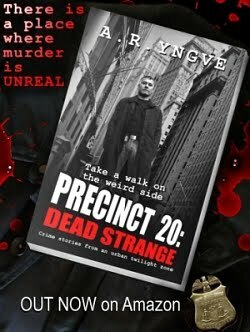 "It was terribly fun to write up... lots of these are based on rejections of now-famous books." Stephen King's CARRIE Was Rejected HOW Many Times?? Gee, I didn't know that Stephen King's breakthrough novel was rejected 30 times. Surely it must be part of a massive conspiracy to make big publishing houses seem like a bunch of clowns...? Read the list of 14 bestsellers which were rejected many, many times. And don't give up. Check out my official website for new sample chapters of the novels BLOOD & SWINE and THE TIME IDIOT, plus a new chapter of the web serial DARC AGES. "Hey!" Prescott called out to the other cell. "Wake up! I've gotta ask you something!" The other prisoner stopped snoring. "Shut up," he moaned. "My head hurts. God, that was some foul booze! I'll never drink home brew again." "Listen up! I need to know a few things. Like, what's going on?" The prisoner sat up, groaned and rubbed his neck. He was wearing a wrinkled infantryman's uniform. "What the hell are you talking about?" He spoke with a slight slur. "You know, our country. Are we at war?" The prisoner scratched his unshaven chin and made an effort to focus his eyesight on Prescott. With his bronze skin, sharp nose and high cheekbones he resembled a Native American. "Whaddya mean, 'at war'? We're always at war with someone or something. It's America's Manifest Destiny to fight the good fight!" If the soldier was attempting sarcasm, it went right over Prescott's head. "Is the Cold War still going on?" "What, there's a cold one now?"